For me, making the decision to teach ESL came off the heels of leaving a long term job I was no longer satisfied with. I was in need of a life change and I was uncertain of what steps to take next. My previous job involved training and motivating adults and it developed my desire to teach and to facilitate. 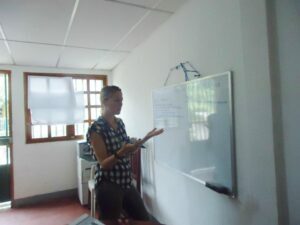 Teaching was something I was seeking but I also thought I would breeze through the TESOL certificate course and jump into the skill naturally and with ease! Boy, was I wrong! Teaching English is definitely worth it but, like any other skill, it requires patience, effort and ongoing growth and development. Here are 5 things you need to be ready for when starting out. 1- Lesson planning takes time and patience! The practicum taught me how much effort is involved in writing well-thought out lesson plans that satisfy the needs of my students. There is much to think about when drafting up a good lesson plan, from the assumptions, to the aim, to the step-by-step process of what you will do once each activity is complete. In the beginning, it took me hours to write a good lesson plan! Luckily, I am a natural performer and love to speak in front of people but it was also a skill that took time to develop. If you want to teach ESL, be ready to treat your students almost like an audience, they expect you to be energetic and engaging, and to teach them the language in a new and exciting way. Although many schools have a built-in curriculum, the reality is that students won’t always engage well with the material in the textbook. It is very important to know how to supplement the textbook. I now carry around a binder with photocopies I’ve collected of a variety of different activities and ideas which are divided by grammar topic or language point. I am still learning how to scan through the textbook to notice where I think the students might lose interest and how I could take that language point and teach it in a new and creative way that would meet their specific needs. One of the first things you will learn in your TESOL / TEFL / TESL course is about the topic of learning styles. You will discover that every student is different and each student learns at a different pace. It is very challenging to meet each and every students’ individual need, but you can definitely take note of the students who learn quicker than others, for instance, and find ways to challenge them further. Be prepared to use a variety of visual, auditory and written material to meet the many different learning styles and to adjust your speaking pace. Peer-to-peer editing, for example, is an excellent way to challenge more advanced students on a writing assignment. 5- The learning never ends! Although you are perceived to know everything by your students, you are also a student. Be open to learning new and innovative ways of teaching, attend workshops and make sure you take the time to simply have fun! 3 Ways A TESOL Course by OnTESOL Will Make You A Better Teacher Teaching English in Germany: Make Extra Money Teaching One-to-One!